Bobby will be out and about signing and selling books in October. If you can make it out to any of the following events please stop by and say hello. Keep checking http://bobby-nash-news.blogspot.com/ for updates. 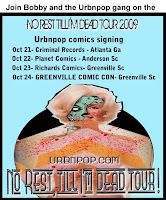 Bobby joins the Urbnpop "No Rest til I’m Dead" Tour. Wednesday, October 21, 2009: Criminal Records in Atlanta, Georgia. BUY EVIL WAYS - A NOVEL OF FEAR AND SUSPENSE FOR $19.95. Click http://tinyurl.com/leualv or the title above. Sale ends September 25, 2009. I'm trying to convince the publisher that Evil Ways will sell better at lower price point and they've agreed to lower it for a limited time as a test. If you've been wanting to buy it, this is the time. If you can helpspread the word I would appreciate it. Edit 09/27/09 - It looks like my novel, Evil Ways is still available for $19.95. http://tinyurl.com/leualv. Cool. Sneak peek at the Lance Star comic book series ad designed by James Burns, who did the art for the Lance Star: Sky Ranger comic "One Shot!" This ad will appear in the Lance Star: Sky Ranger pulp anthology vol. 2. We're starting to make some progress. Keep watching this space and http://bobby-nash-news.blogspot.com/ for more information. THIS HORSE AIN’T DEAD, JIM! I’m the guest blogger on Howard Hopkin's Dark Bits Western Wednesday blog this week. Only I could work Star Trek, NCIS, Boston Legal, Tombstone, & the Lone Ranger into a blog about westerns. There's also a little pulp information in there too. Mosey on over to http://howardhopkins.blogspot.com/ and & check it out. HE HUNTS AMERICA’S MOST WANTED!! 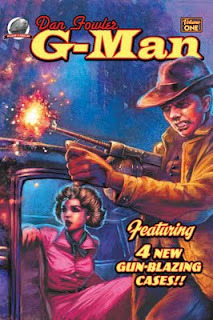 The greatest, two-fisted, gun-blasting pulp G-Man of them all returns, in DAN FOWLER G-MAN Vol One. Folwer is the toughest F.B.I. agent of them all for many years, in the pages of his own pulp magazine, he fought America’s outlaws with nerves of steel and unrelenting duty. Now, four talented new pulp scribes deliver brand new stories featuring Fowler, fellow agent Larry Kendall and the ever loyal lovely, Sally Vane. Follow them into The Dungeon of Death by Gregory Bastianelli, the Harvest of Crime by B.C.Bell, The Music of Murder by Aaron Smith and Andrew Salmon’s Dan Fowler And the League of Dead Patriots. Each story is a hard hitting action adventure tale set in the thrill packed days of yesterday, each a genuine gem of purple prose you will not want to miss. Featuring twelve black and white illustrations by Kelly Everaert, a cover by Robert Brown and designed by Rob Davis with editing by Ron Fortier. Get your Tommy guns loaded, gas up the Studebaker and prepare yourself for a wild reading experience as Dan Fowler G-Man is once again on the hunt! Airship 27 Productions. Pulp fiction for a new generation. If you run... they will find you! Arcana has released the cover and release date for the graphic novel I wrote called Yin Yang. 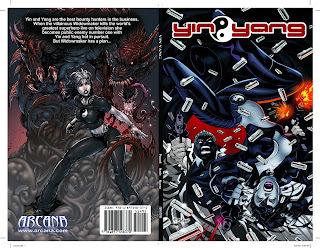 Yin Yang is the story of brother and sister super-powered bounty hunters named Yin and Yang. They are the best in the business. No one escapes them. Working for dedicated Federal Marshal, Wade Kendall, Yin and Yang go after meta humans who use their powers to live above the law. Look for Yin Yang in stores the 2nd quarter of 2010. Check http://bobby-nash-news.blogspot.com for information and updates.